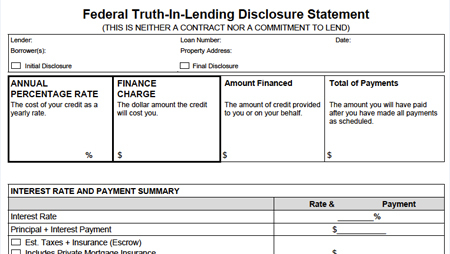 A loan’s APR is printed in the top-left corner of the Federal Truth-In-Lending Disclosure, as shown above. When quoting an interest rate, loan officers are required by law to disclose a loan’s APR, too. APR is meant to simplify the process of choosing between two or more loans. The theory is that the loan with the lowest APR is the “best deal” for the applicant because the loan’s long-term costs are lowest. However, the loan with the lowest APR isn’t always best. APR makes assumptions in its formula that can render it moot. First, APR assumes you’ll pay your mortgage off at term, at never sooner. So, if your loan is a 15-year fixed rate, its APR is based on a full 15 year term. If you sell or refinance prior to Year 15, the math used to make your loan’s APR becomes instantly flawed and “wrong”. Example: Let’s compare two identical loans in Tennessee — one with discount points and a lower interest rate; and one without discount points and a higher mortgage rate. The loan with discount points will have a lower APR in most cases. However, if the homeowner sells or refinances within the first few years, the loan with the higher APR would have been the better option, in hindsight. Second, APR can be “doctored” early in the loan process. Because the APR formula accounts for third-party costs in a mortgage transaction, and third-party costs aren’t always known at the start of a loan, a bank can inadvertently understate them. This would make the APR appear lower than what it really is, and may mislead a consumer. And, lastly, APR is particurly unhelpful for adjustable-rate loans. Because the APR calculation makes assumptions about how a loan will adjust during its 30-year term, if two lenders use a different set of assumptions, their APRs will differ — even if the loans are identical in every other way. The lender whose adjustments are most aggressively-low will present the lowest APR. Summarized, APR is not the metric for comparing mortgages — it’s a metric. For relevant comparison points, talk to your loan officer. By Phillip Cantrell|2015-02-11T15:01:54-05:00July 12th, 2011|Agent Blog, Consumer Blog, Real Estate Definitions|Comments Off on What Is Annual Percentage Rate (APR)?